Oak shoot browning is spatially widespread throughout the region of Extremadura (SW Spain) following an aggregative distribution pattern, with a much higher prevalence in cork than in holm oak. Shoot browning is considered a potential contributing or inciting factor to oak decline in SW Iberia. Two causal agents are typically involved, Coraebus florentinus Herbst and a fungal complex in the genus Diplodia Fries (teleomorph Botryosphaeria De Cesati & De Notaris). Our goals were to map oak shoot browning incidence in Extremadura and to explore geographical/environmental factors potentially involved using a novel image-based prospecting method. We used online imagery provided by Google Maps/Google Street View. A virtual sampling protocol permitted to inspect, characterise and georeference forest stands and damaged oaks throughout > 5000 km of navigation. Geostatistical interpolation analyses (Indicator Kriging algorithm) and validation processes were conducted to generate probability maps of shoot browning incidence. We prospected 6478 forest stands in which 3410 oaks with shoot browning symptoms were identified and georeferenced. Damage had a clustered distribution pattern both at the regional scale (IK-based probability maps) and the stand scale (fitting to negative binomial function). Factors such as oak species, stand type (pure vs. mixed), treetop orientation, tree aspect, altitude, ground slope and some interactions among them significantly affected shoot browning incidence. 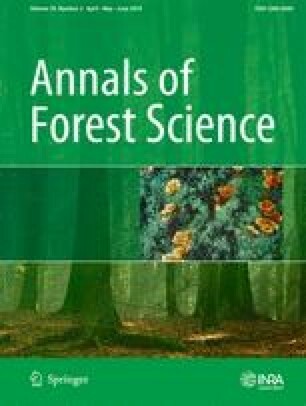 We provide the first integrating overview on the distribution and prevalence of oak shoot browning at a regional scale in SW Spain and we also define the effects of some geographical/ecological factors involved. Contribution of co-authors Luis M. Torres-Vila: designed the experiment, contributed to data acquisition and data analysis and wrote the first draft of the manuscript. A. Cristina Echave-Sanabria: contributed to the experimental design and data acquisition. F. Javier Mendiola-Díaz: contributed to data analysis and paper revision. Francisco J. Moral-García: contributed to data analysis and paper revision. We greatly appreciate the constructive criticism of three anonymous reviewers. This research was supported by the Servicio de Sanidad Vegetal (SSV), Junta de Extremadura.